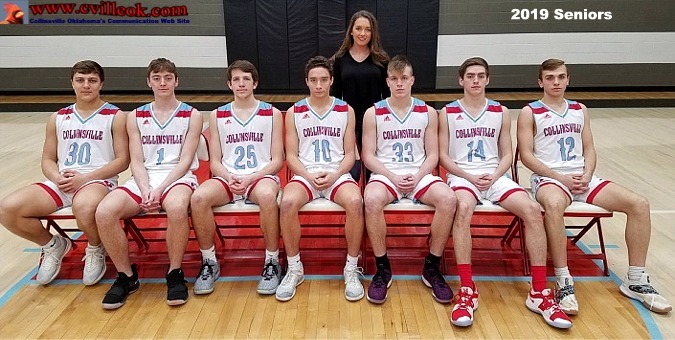 2018-2019 Collinsville HS Varsity Basketball Boys -- Back Row (L-R): Mikiah Bayes (Manager), Delaney Cottingim, Cole Dugger (11), Gage Longshore (22), Caden Buoy (15), Gage Tacker (24), Caden Fry (20), Nathan Serna (23), Corey Dees (13), Etrhan Cole (21), Melody Trost (manager), Morgan Dickinson (manager) and Jocelyn Darland (manager). -- Seated Front Row (L-R): Jake Tuttle (30), Parker Holmes (25), Payton Dees (1), Lincoln Sallee (10), Jalen Dees (33), Drake Rule (14) and Caleb Shafer (12). 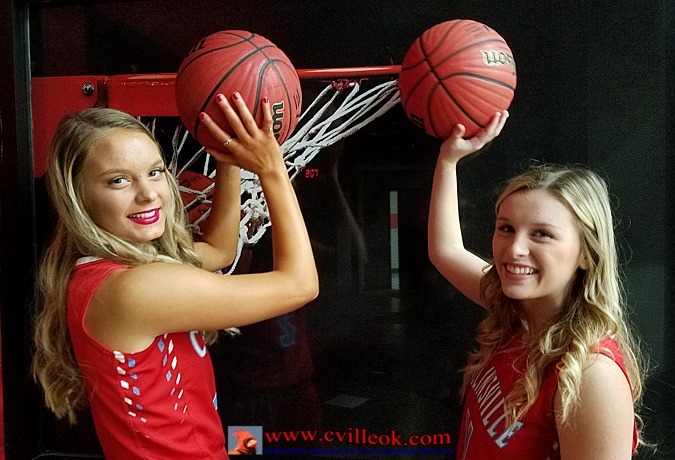 2018-2019 Collinsville HS Varsity Basketball Girls -- Back Row (L-R): Abby Cantrell (manager), Kamilynn Marshall (manager), Carley White (31), Kelsie Baker (22), Riley White (12), Brooklyn Farley (33), Madison Carlile (5), Elizabeth Aman (15), Lexi Gregory (51), Megan Seyrkles (10), Faith Curtis (42 injured), and Braytin Kuykendall (manager). Seated Front Row (L-R): Jolie Cole (35), Kelly Ellis (20), Makayla Davis (25), Abby Stacy (11), Bryn Willt (2), Addison Wickman (3), and Segen Henley (1). 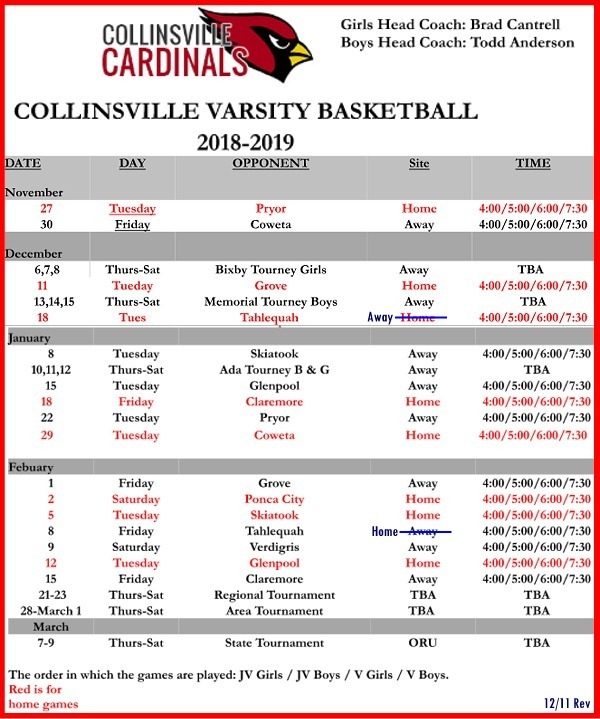 2019 JV Boys -- Standing Back Row (L-R): Zared Cole (1), Colton Plowman (22), Brandon Morgan (33), Jeremy Pitts (25), Gage Tacker (30), Nate Wilkins (21), and Jesse Robinson (22). -- Seated Front Row: Blake Mathes (23), Riley Jackson (20), Aiden Calloway (21), Dallas Ford (14), and Lendon Wilson (15). 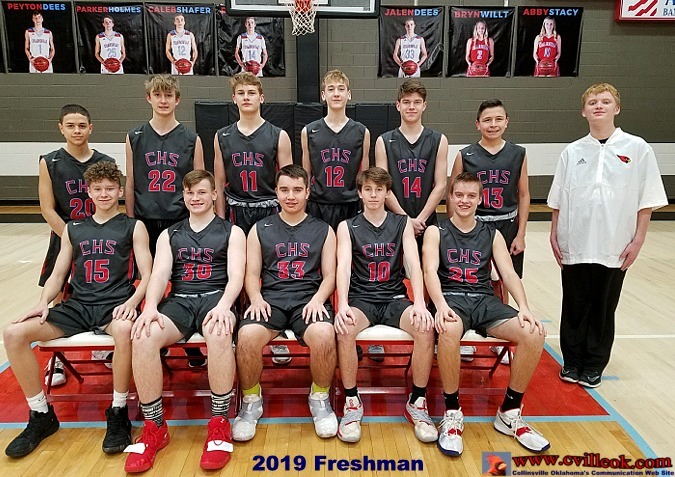 2019 Freshman Boys -- Standing Back Row (L-R): Ray Brown (20), Bret Guesnier (22), Oscar Hammond (11), Cameron Himebaugh (12), Cooper McDonald (14), Cade McSorley (13) and ______?? (manager). -- Seated Front Row: Jarub Scyrkles (15), Peyton Stacy (30), _________?? (33), Chaysten Schlomann (10) and Will Savage (25). 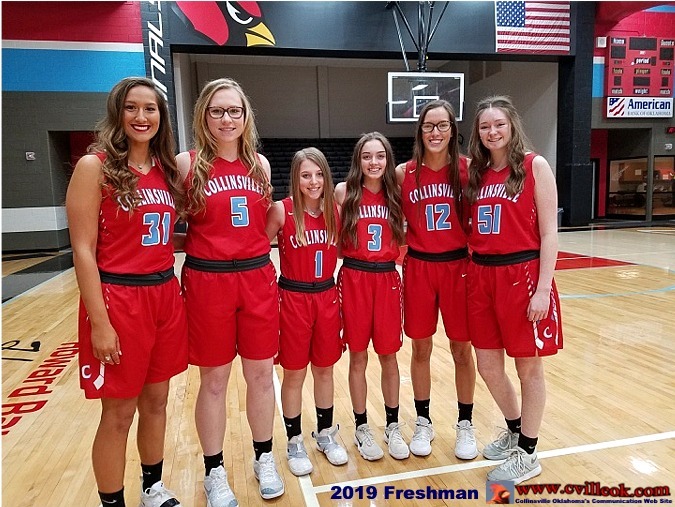 2019 Freshman Girls -- (L-R) Carley White (31), Madison Carlile (5), Segen Henley (1), Addison Wickman (3), Riley White (12), and Lexi Gregory (51). 2019 Seniors -- Delaney Cottingim (in back) -- Seated (L-R): Jake Tuttle, Parker Holmes, Payton Dees, Lincoln Sallee, Jalen Dees, Drake Rule and Caleb Shafer.